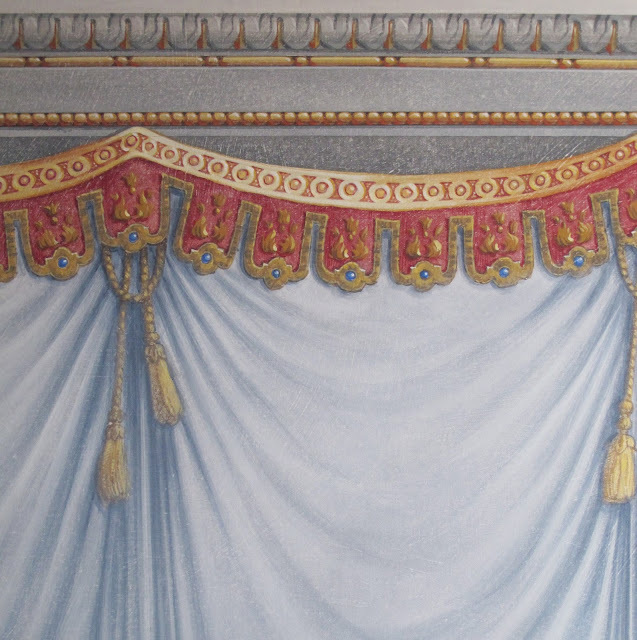 Creating the "gold" beaded molding above this painted curtain was a relatively simple affair. Because there are so many of them across the whole surface (of which you're only seeing a small crop here), it pays to simplify the technique so that you don't lose your mind or, more importantly, your money. Here's how I did it. First, I used blue tape to section off the area I wanted to paint, and laid down a wash of yellow ochre toned down with some raw umber. Next, I striped along the top edge with a line made from cadmium yellow, yellow ocher and a drop of white, and along the bottom edge with a line of burnt sienna, burnt umber and a drop of yellow ocher. Then I cut a stencil. This will be for the dark areas between the beads. Use a stencil brush to pounce a dark color made from burnt umber, raw umber and ultramarine, repeating your stencil across the full length of the molding. Here's how it looks after I take the stencil away (above). I used a fine pointed brush to lay a stroke of burnt sienna and burnt umber along the left edge of each bead. Notice that my stroke is slightly inside and away from the bottom edge of each bead. This gives the illusion of a reflected highlight. Then, I added a small stroke of titanium white with a hint of cadmium yellow for the bright specular highlight. It too is placed in and away from the top edge of the bead. Lastly, I added a dab of cadmium red opposite the specular highlight, and removed the blue tape. Here's a close-up of how the completed molding looked. You can see that I used a similar method (but different colors) for the grey tongued molding along the top. This technique is quick, and useful in many scenarios. Fantastic, thanks for the tip. Quite usefull for me in this very moment; thank you so much. Breaking the Law! On Rules and Rule-Breakers.